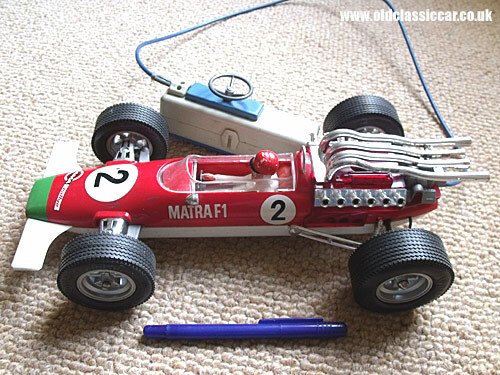 A remote control Gama toy racing car - the Matra F1. 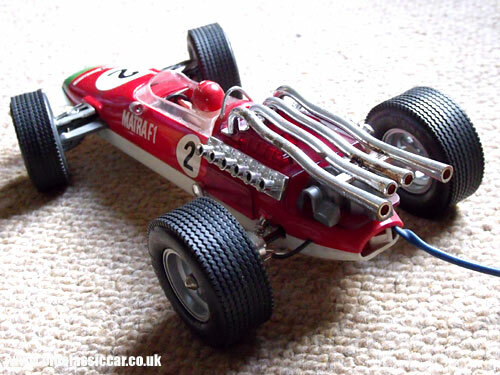 Matra F1 racing car by Gama. Remote control F1 racing car. This large and well-made toy racing car was produced by Gama of Germany, I'd estimate at the very end of the 1960s. It incorporates a remote control handset, connected to the car via a cable that not only carries the wiring to the car's motor, but also a cable that links in with the car's steering. Despite the main body of the car being of plastic, it is quite a heavy toy and measures some 12.5" in length. Rubber tyres, wider at the rear, and all wearing "Continental" logos, are fitted, as are decals for "Gama Rallye" and also "Matra F1", presumably on whose car this is loosely based. The toy features two banks of six carb air inlets, hinting at a V12 engine. In 1968, the Matra F1 team introduced a V12 engine with their MS11 car at the Monaco Grand Prix. 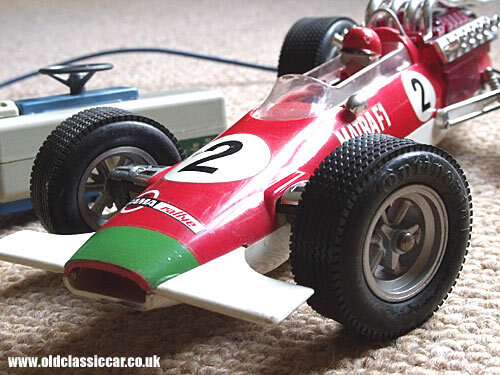 An earlier tin-plate racing car, also by Gama, can be seen here.